Our systems transfer energy from the electric motor or gas and diesel engines to the hydraulic motor on the submersible pump with 92% efficiency. The resulting total system efficiency rivals that of any like sized electric submersible run off a generator. All of our submersible pumps offer variable speeds to adjust to pumping conditions. And, because we design many of our pumps with an eye towards satisfying the needs of rental customers, a single model can handle many tasks like sewage, sludge, driller’s mud and just plain water. On the power unit front, we can and do build systems to run any device requiring hydraulic flow and pressure. 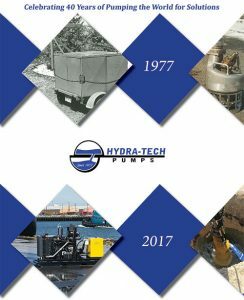 With an initial cost about the same as a direct coupled centrifugal pump and typically less than an electric pump with generator, an investment in Hydra-Tech equipment makes sense up front. And, when you think about the ease of repair, minimal number of wear parts, relatively low cost replacement parts and overall efficiency, it is easy to understand that over the years and years of use, these pumps and power units will pay for themselves. We build it here. Using castings made primarily in Pennsylvania, we partner with other domestic sources to make every attempt to keep our product Made in the USA. Our factory in PA employs 20 plus people, all dedicated to creating equipment any American would be proud to recognize as home grown. One solid year of warranty covering any failure of equipment due to poor craftsmanship or defective component parts. Our warranty on paper is up to industry standards and in practice is one of the most liberal policies offered by any pump company.